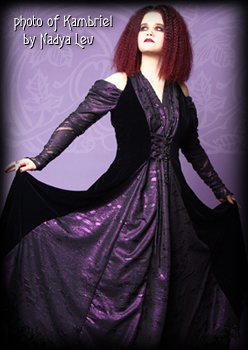 Since 1994, Kambriel has been offering her designs (originally created under the name "Atrocities") based out of a love of creating finely hand made, eerily beautiful gothic clothing for those of a darkly elegant nature. Inspired by a desire to bring out an individual's deep intrinsic beauty, the finest fabrics and trims are researched and selected, with each garment being constructed by hand ~ always with a respect for old world craftsmanship and a passion for exoticism. Providing an exquisite array of designs rooted in a mysterious elegance, long, fluid fabrics are fashioned into pieces of timeless antiquity, conjuring up images of a grand masked ball, in which elegant ladies and gentleman from an array of various cultures and eras are all gathered together for an evening of enchantment and mystery. From the regal Victorian lady about town, with her many-layered bustle and perfectly-fitted bodice, to the fin de siecle gentleman, whose silk waistcoats and Venetian lace cravats are on a par with the exquisite clothing of the ladies who mingle in his artistic circles. Sweeping skirts and soft, billowy sleeves, capes and velvet hoods lined in luscious satins... all pieces work together effortlessly if layered, such as the softly gathered gown inspired by a medieval damsel's nightdress, the Pre-Raphaelite muse's perfectly simple yet startlingly divine dress, or the stark and sultry lean silhouettes of silent screen goddesses and Edward Gorey's own 1920's vamps and femme fatales. Kambriel's designs mirror that of such opulent characters and their eras ~ made with a careful attention to detail, right down to the buttons which often seem as if they borrow their gleam from the moon itself or even, from the sinister smile of a sullen Medusa. Such is clothing for those who are a dramatic individualist or a romantic at heart. Focus has also been featured upon the lushly printed catalogue which has been reviewed as an awesome aesthetic undertaking in itself, in which the atmospheric photographs are artistically suited to the fashion which they showcase, coming across from print to eye like stills from a Victorian era set horror film. Such a high standard of quality, in both merchandise and presentation is quite rare these days. Each garment is a labour of love made to fit the wearer not only in size, but personality as well. Selections of darkly romantic clothing and accessories for men and women made from fluidly draping silks, intricate laces, and luscious velvets include bridal and handfasting gowns and veils, embossed velvet opiate jackets, cassocks, hooded capes, diaphanous overdresses, ballet skirts, shirts, blouses, and more ~ even including decadent pillows and coverlets for the home! Kambriel plans to unveil a new selection of her one of a kind, custom designs which take on a haute couture flair. These are creations which recall the poetic daring of artists like Diaghelev, Mucha, Poiret, Erte, or Klimt, and the imagination of Kambriel is every bit as brilliant. All this and more to come as Kambriel constantly creates new designs to tempt creative individuals everywhere! (1996-2003) Annual Salem Vampire's Ball - Salem, MA - Kambriel's 1996 fashion show was broadcast on "The Discovery Channel". View photos of our fashion shows here. Custom jackets created for various event appearances, and personal use. You can see photos of Neil Gaiman on the Oscars red carpet in our customer gallery. or here for our Customer Gallery. Various outfits commissioned for on-stage performances, awards galas, and personal use. You can see photos of Margaret Cho in our customer gallery. "The Temperamental Wobble" - A full scale dance theatre piece based on the art and humour of Edward Gorey - This work was premiered in Boston, MA and is now a touring work, performing in locales such as Tokyo, Japan. Click here for a selection of costume photos from the Gorey Production! For a few samples of articles on Kambriel, please see our press/articles page.